home > articles > Is The Bible Tomorrow’s Newspaper? The Bible is uniquely prophetic. No other religious or holy book makes predictions of the future like the Bible does. This phenomenon has led some Bible teachers to over-emphasise the Bible’s ability to predict the future. The rise in claims of the Bible’s prophetic detail coincided with its increased availability. When medieval scribes increased production of Bible copies the number of prophetic speculations also increased. When the Gutenberg Bible revolutionised the way Bibles were produced from the 1500s, there was similarly a marked increase in the number and variety of prophetic speculations. Although the Bible was written by some 40 authors over a period of around 1600 years, and although the Bible was completed almost 2000 years ago, it is as current as tomorrow’s newspaper. This is because it was inspired by the God of the universe who made man and the world in which he lives. These prophecy teachers and this type of website claim unabashedly link belief in God and His Word with the idea that the Bible can be read like tomorrow’s newspaper. I want to show you that this is an entirely unreasonable claim and conditions readers of the Bible to accept wild speculations as normative Bible interpretation. Recently, I had an evangelist, with two decades of travelling ministry to his credit, contact me after he read my book- The Most Embarrassing Verse In The Bible. In this book I show how to best interpret the major prophetic themes of the Bible. I show that all the events of Matthew 24 align with Revelation 1 – 19 and are now fulfilled – and will not be repeated. While the evangelist accepted this, he was disappointed that I hadn’t speculated from Scripture about what the future held. Sadly, this evangelist had been infected with the faulty hermeneutical virus of TBIMATTN (The Bible Is More Accurate Than Tomorrow’s Newspaper). Even he had been conditioned to read the Bible as if it spoke of our day. While it is true that the Bible does still have some unfulfilled prophecies pertaining to the return of Christ, it is a dire mistake to read the Bible as if it spoke like tomorrow’s newspaper to every generation since its writing. We should begin to interpret Bible Prophecy with the same basic principles of Biblical interpretation that we interpret any other passage of Scripture. Perhaps the first thing we should realise is that the Bible (including, and perhaps, especially, Bible Prophecy) was not written to us but it was written for us. That is, the writers of the Bible had a particular immediate audience in mind when God was inspiring their text. For example, when Paul wrote Second Timothy 4:13 it would be ludicrous to claim that he intended this to be an instruction for any other reader than the one the epistle was addressed to. Therefore, it is very possible that was future to the original audience is now past for us today. For example, when Paul recorded the prediction that the man of lawlessness was to enter the temple and sit on a seat and exalt himself above God, it was future to his audience but is now past to us, since this is exactly what the High Priest did in the period between 66AD to 70AD. When Christ declared in Matthew 24:14 that the Gospel of the Kingdom should be preached in all the “world” then the “end” would come, most modern readers miss the immediate meaning of “world” (which is not kosmos, that is, the entire world) but is a particular Greek word: oichoumene – which to the original hearers and readers of this statement would have meant The Roman Empire (of the “known” world). Thus, when Paul wrote to the Colossians (1:5b-6) that the Gospel had indeed gone into all the world he was referring to the Gospel having been delivered to every Jew in the Roman Empire just prior to his execution. And when Jesus spoke of “the end” in Matthew 24 He was not speaking of the end of the world. But how many modern readers realise what Jesus and His disciples actually meant by “the end of the age“? When it comes to ‘interpreting’ Bible prophecy, some teachers only have one method: speculation. That is, they come up with a theory then ‘massage’ the Scriptures to make them fit this guesswork. One of the worst speculations I have ever heard about how to interpret Bible prophecy came from Dr Hugh Ross. Dr Ross is a great Cosmologist, if not one of the best in the world, but he is a very weak Eschatologist (someone who interprets Bible prophecy). He has one of the most imaginative views of Pre-Millenniumism I have ever heard! He proposes that Bible prophecy forecasts a restoration of Israel’s fortunes which will immediately precede and precipitate the return of the Lord Jesus Christ. According to Dr. Ross, Christ will reign from Jerusalem for a literal 1,000 year period. During this reign, mankind will be without excuse for not serving the Lord wholeheartedly. This, says Dr. Ross, is the main point of the Millennium: it will expose the true condition of man’s heart as rebellious and dismiss all excuses for disobedience. To be fair, Dr Ross offers little in the way of Biblical support for this theory. He loosely frames this theory around Revelation 20 and some of the prophecies of Isaiah and Jeremiah. But this theory is a failed theory. Revelation 20 speaks of the reign of Christ from the end of the Old Covenant Age (the Age of Sacrifice, the Age of the Mosaic Law, the Temple Age = “the end of the ages” which is described in Revelation 19). The end of the ages began with the Cross of Christ. It ended with the destruction of the Old Covenant elements- the Temple, the Priesthood and the Sacrifices – which happened in 70AD. In Revelation 20 it prophesied the reign of Christ for 1,000 years. Despite Dr Ross assuming that this one referencing of 1,000 years means that the reign of Christ will be a literal 1,000 year period, the Bible uses “1,000” to mean something in just the same way that other numbers in the Book of Revelation mean something. But how many modern readers of Scripture know what the Bible means when it uses the expression “1,000”? How many prophecy teachers have speculated wildly about the events of Revelation 1 to 19 leading up to this expression about the duration of the reign of Christ by assuming that it refers to our day? Before we assume that the Bible’s prophecies have not been fulfilled, we should examine history to learn whether they are already fulfilled. After doing this we will discover the events of Matthew 24 are all fulfilled and Revelation chapters 1 to 19 are similarly fulfilled. What is yet to be fulfilled is: the return of Christ, the Resurrection, Final Judgment, and the Eternal state. For those who have been conditioned to regard the Bible as tomorrow’s newspaper this is going to be a very disappointing interpretation of what the Bible says is yet to happen. People suffering from this condition demand that the Bible reveals the immediate destiny of the United States and what will happen to the global economy. Instead, the Bible reveals that while we await the return of Christ we are to be busy about the Lord’s work- the Great Commission. We should be sowing Gospel-seed that can be harvested for generations to come. We should be salt and light to our communities. We should be a prophetic light exposing the darkness being promoted by the world’s politicians and media outlets. Does the Bible prophesy that we will succeed at this? This is actually the wrong question! Scripture presents God’s desire for all people to be saved; all nations to worship Him; and for the Gospel to be taken to every every nation – but it also tells us that not all people will choose to surrender to Christ and that followers of Christ can expect tribulation as they take the Gospel to the world. I know this doesn’t have the same sensational buzz about it as it does when the Newspaper Eschatologists make their wild speculations about the horrors of what they claim the Bible says the future holds, or when they claim that the Book of Revelation forecasts the precise destiny of the USA or Europe or any other nation of the world of today. 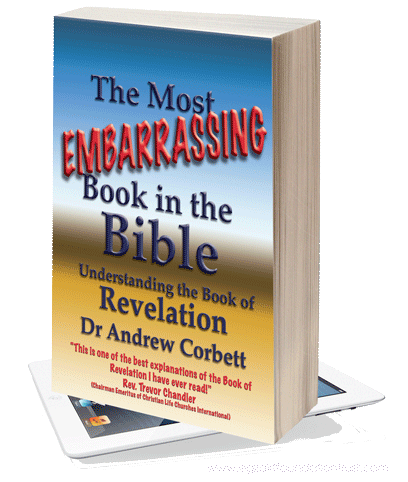 I have written a fuller explanation of the book of Revelation in my eBook- THE MOST EMBARRASSING BOOK IN THE BIBLE (click here to read a preview).